Everyone in my family agreed a few years back that we were going to simplify Christmas and one of the ways we were going to do so was by not making as much food. After all, we were all trying to keep our weight under control so it seemed like a logical thing to do. Sooooooooooo . . . I did not make the poppyseed coffeecake. OMG, you’d have thought the world had come to an end!!! No one could believe that I didn’t make the poppyseed coffeecakes! What we all discovered that Christmas was that it doesn’t matter to us individually if someone doesn’t do THEIR favorite thing but we never think it will be OUR favorite thing that is cut out in the simplification process. I learned that this is NOT one of the things that can be cut out of Christmas as far as my family on both sides are concerned!! I hope you enjoy this coffeecake as much as the members of my extended family do. Here’s a slice so you can see what it looks like on the inside. 1. In a large bowl mix the flour, salt, and 2 t. of sugar. Cut the butter into the flour mixture with a pastry blender or two knives. 2. In a one cup measuring cup mix together the yeast, warm water, and 1 t. of sugar. Let this mixture sit until it foams to the top of the measuring cup. Meanwhile complete step 3. 3. In a medium bowl beat together the sour cream and egg yolks. 4. When the yeast has foamed to the top of the cup mix it into the sour cream mixture. 5. Add the wet mixture to the flour and butter mixture. Mix until all the flour mixture is completely incorporated. Form into a ball, cover the bowl with plastic wrap and refrigerate overnight. 6. The next day cut the ball of dough in half. For each half follow the following directions. 6a. Pat the dough into a flat circle and place on a floured surface. Sprinkle a little flour on the dough and be sure to flour your rolling pin. 6b. 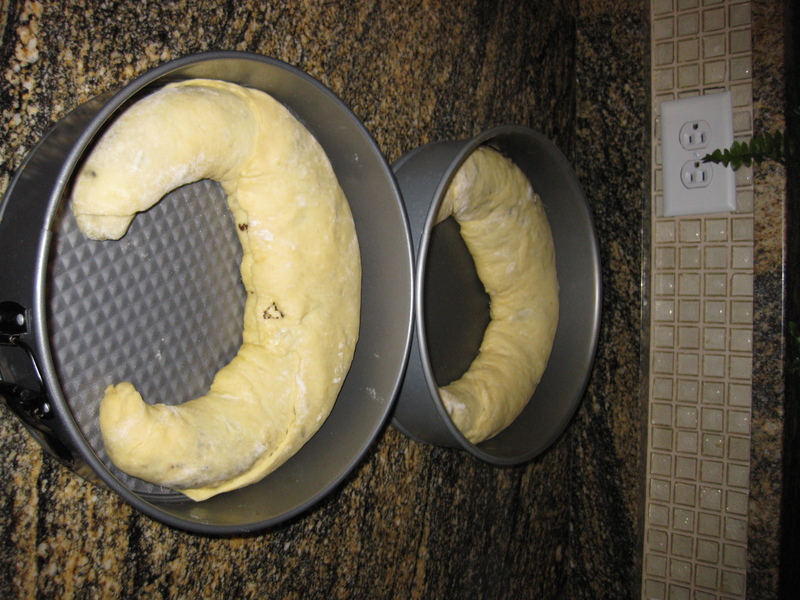 Roll out the dough as thin as possible on a floured surface until it is about an 18 inch circle in diameter. 6c. Spread the circle of dough with 1/2 of the can of poppyseed pastry filling. 6d. Roll the pastry up into a roll and pinch the ends closed. 7. Repeat all parts of step 6 with the rest of ingredients. 8. 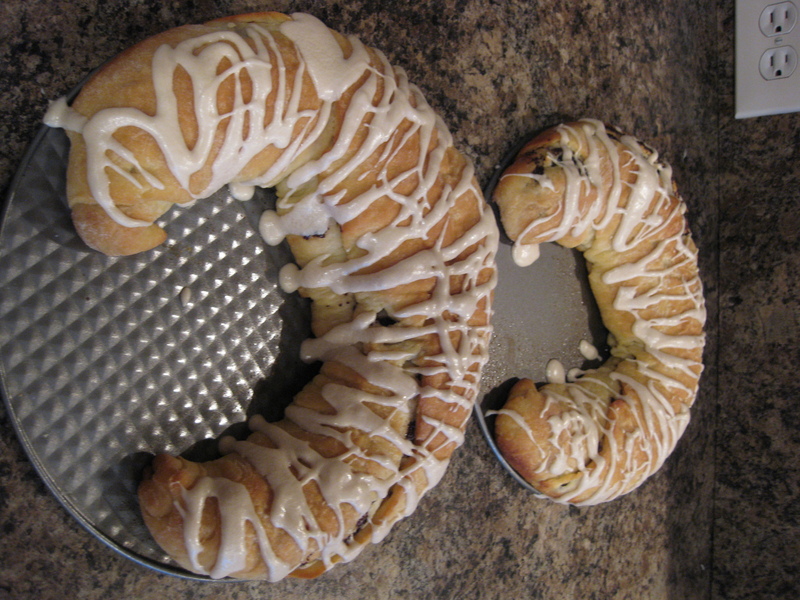 Place each coffeecake in a round cake pan or both on a large cookie sheet. Cover with waxed paper and then a towel and place in a warm location. Let rise until double. This can take anywhere from 45 min. to an hour and half depending on how warm or cool it is. 9. Bake at 375 degrees for 25-30 minutes. When completely cooled drizzle with confectioner’s sugar icing made by mixing 1 cup of confectioner’s sugar with 1/2 t. of vanilla and 1 T. of water. Add addtional water if needed to make desired consistency for drizzling. I like Option # 1 and I also like the 4 “F” all on one line!